We’re being massively spoiled with awesomely watchable and addictive drama this autumn. Which is just as well because we need something to catch up on during the talent show abyss on Saturday and Sunday nights. Following hot on Doctor Foster’s kitten heels is Unforgotten, a murder mystery almost 40 years old. You’d be forgiven for assuming that it was going to be Just Another Crime Drama. It certainly appeared that way from the snippets ITV have trailed and the Just Another Crime Drama feel to the posters, grim faces, police tape etc. But, after episode one, I’m happy to report that it is (so far) anything but. There are cops in it – kind of necessary in a murder mystery, really. 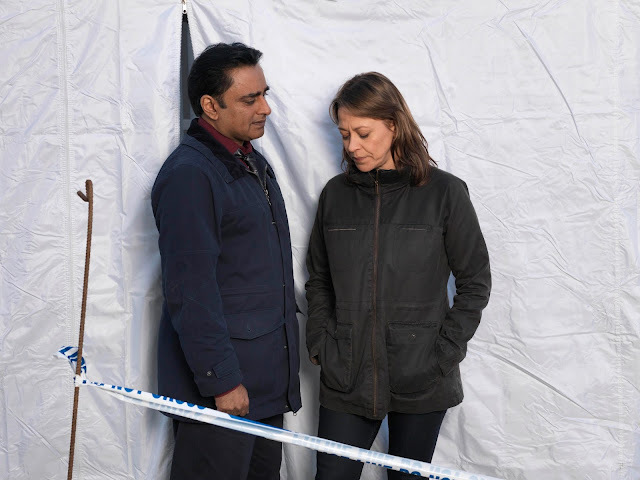 Nicola Walker and Sanjeev Bhaskar are DCI Cassie Stuart and DS Sunil ‘Sunny’ Khan. They’re called in when human remains are discovered under a demolished house, but it’s impossible to tell if the bones are 50 or 500 years old. Thanks to some rather wondrous happenings in The Lab and some smart detective inspecting from Walker and Bhaskar, by the end of the episode we know the victim was a young man called Jimmy Sullivan and he was bludgeoned to death 39 years ago. So far, so Just Another Crime Drama, you’re thinking. Let me stop you there. It was clear from the opening few scenes that there is a lot more going on here. First of all there’s the pretty impressive cast – alongside Walker and Bhaskar are Sir Tom Courtenay, Bernard Hill, Ruth Sheen and Trevor Eve who appeared to be the main suspects. Almost 40 years since the murder and they’re all settled in their lives. Father Robert (Hill) is married with two daughters and is possibly fiddling the donation tin in his parish. Sir Phillip Cross (Eve) has just been appointed as a government Czar and is a self-made millionaire, with a glam wife. Lizzie Wilton (Sheen) is married and helping out disadvantaged kids after losing her own son. Eric Slater (Courtenay) is the wheelchair-bound carer of his wife, who is suffering from dementia. He also spoke about the suspects being old, citing his own emotions whilst watching a pensioner picked apart by the press for a historic crime. “I was interested in looking at fairly old suspects. I was surprised at how, despite his crimes, I actually felt sorry for the old man harried by the press pack and was interested in exploring this emotional anomaly.” My tip, pay close attention to Eric Slater. Tom Courtenay said at the same launch that he was drawn to the character because he was ‘sinister’. The question that bubbled just under the surface of this episode was not just ‘whodunit’, but whodunit and was able to just keep on living their life, keeping their standing in their family and community, for almost 40 years? Is it actually possible to murder someone – and then just carry on living your life as if nothing has happened? And what will happen to that life if the truth came out? And the social dilemma, in these times of cuts and austerity, when public service budgets are being slashed to death, can we justify spending precious resources on a case that was so long ago? All of this was topped off with a stellar supporting cast – Gemma Jones was wonderful as Claire Slater, Eric’s confused wife, Cherie Lunghi, Dominic Power, Claire Goose and Yasmine Akram to name a few. I have high hopes for Unforgotten.